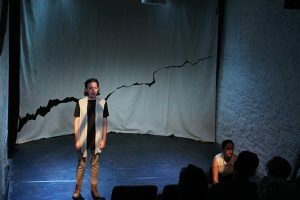 This summer, bad things happen here, a play directed by Lila Rachel Becker ’12, was featured at the Edinburgh Fringe Festival. 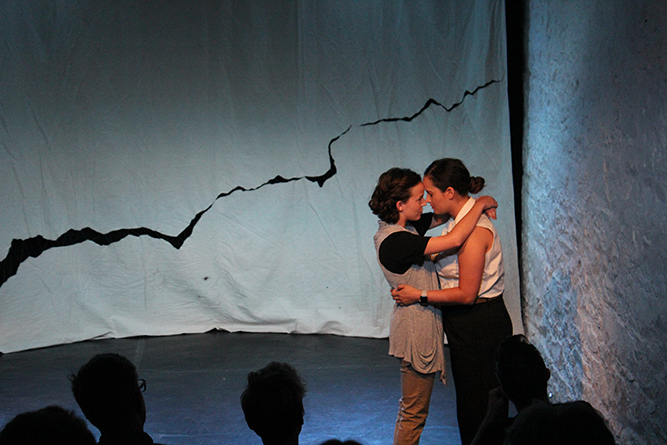 Credits for the Edinburgh photos here and below: Actors: Marieta Carrero and Molly Winstead; Lighting: Courtney Gaston; Scenic: Savanna Genskow and Courtney Gaston; Costumes: Savanna Genskow; Photos: Lila Rachel Becker. A look at Becker’s website shows a clean, minimalist design with a bio that touts highlights from her Wesleyan undergrad days—College of Letters and a continuing affinity for Taiko drumming. She also pursued theater at Wesleyan, focused on acting, until Professor Yuri Kordonsky suggested her real path in theater was directing. 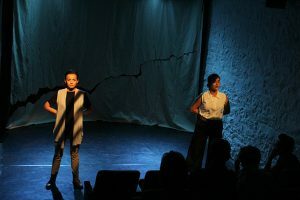 At the University of Iowa, she has particularly enjoyed the collaborative directing process with both actors and playwright, describing it as so organic that it is difficult to name particular innovations to the play that one single party has introduced. What isn’t difficult to see, however, is that the political reverberations of this play have deepened since they began work in 2017. “There’s a scene in which two schoolgirls are trying to find a friend to play with, and they realize that all of their friends have disappeared. There’s this long list of names of children who’ve disappeared,” recalls Becker. While Becker has other plays to look forward to this year, she was particularly glad to bring this one to Edinburgh. “One of the things that puts me in the most despair about the current world situation is that I don’t know how to make anything better. 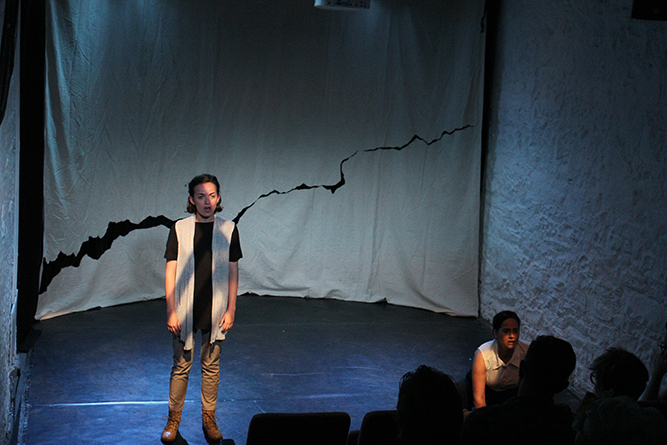 But there’s something very powerful about being a group of theater-makers who come from all across the U.S., who represent a broad spectrum of America, and who are committed to showing an international audience this play about complicity and language and authoritarianism. “If you choose to produce a play now, you’re saying that there’s something in this play that speaks to contemporary audiences. I think that’s already a political move, but this play, in particular, is speaking to a lot of things that are happening globally with the rise of authoritarian regimes and state-sponsored violence and state surveillance. 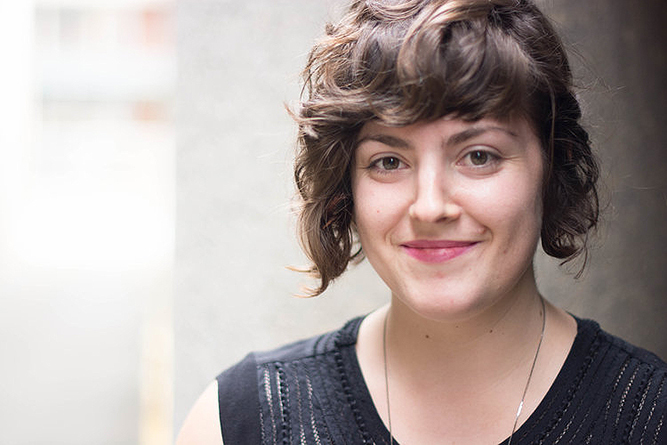 Becker is working on the future life of bad things happen here, which she anticipates will be on tour next summer. Please check here for updates on her work and to find out where you can see this play and others she is directing throughout the year.